Probably the truest actual horror moment in any Treehouse of Horror episode, an innocent teenager being murdered point blank by a policeman. By today’s standards, that’d be scary. Back then, it was good, old-fashioned dark humor (along with the Lard Lad kicking a dog, Otto thinking the Real Estate Devil attacking the bus is an acid flashback, Bart being the Real Estate Devil’s conscience in destroying the school, Kent Brockman’s death on the air being blocked off by a “Please Stand By” card featuring a puppy that looks like Santa’s Little Helper [doesn’t the show know how to draw dogs of different breeds? ], and Homer sending the Lard Lad to beat up Flanders). 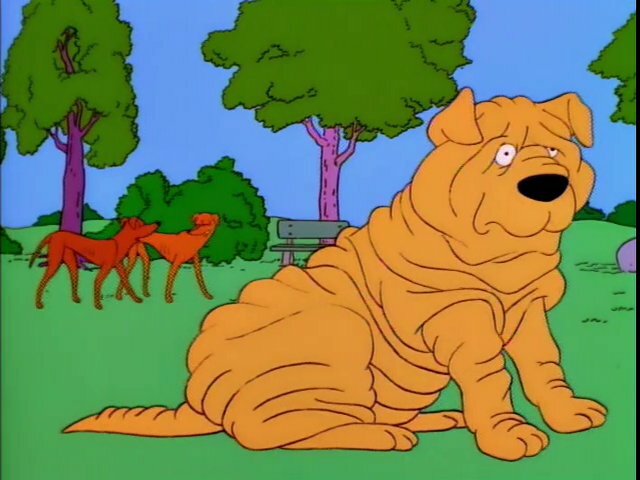 doesn’t the show know how to draw dogs of different breeds?